has cottage cheese because it just melts into the hot pasta. The cottage cheese adds a nice lean protein making it even more filling. Cut up the bacon and fry in a large frying pan. When crispy, remove bacon but leave the drippings in the pan. In a saucepan, bring water to boil and cook the pasta according to package directions. Meanwhile, place the chicken in the same hot frying pan you cooked the bacon in (that still has the grease in it). Season the chicken with onion powder, basil, salt, & pepper. Add the minced garlic to the pan when the chicken is almost finished frying. Once the chicken is thoroughly cooked, turn off burner and remove the chicken to a plate. By this time, the pasta should be done cooking so drain the water and add the pasta to the large frying pan that is full of all sorts of fried yumminess (the pasta picks up the flavors so this step is important). Stir the cottage cheese and previously fried bacon into the HOT pasta and mix well to incorporate. 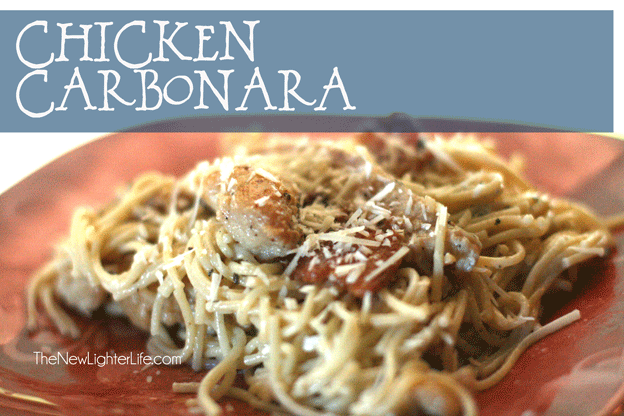 You can mix the chicken into the pasta (we do) or serve the chicken on top of your bed of pasta. Sprinkle with real parmesan cheese and salt and pepper to taste. By the way….can I just say that I LOVE Trim Healthy Mama?! I love that once a week I have pasta (in moderation) and it’s not even considered a *cheat*. It is a versatile eating plan and I don’t feel like I’m on a diet at all! This recipe has been linked up at Gwen’s Nest and Stacy Makes Sense for Trim Healthy Tuesdays. Thanks for linking at Trim Healthy Tuesday. I hope you like it Keren! This sounds deicious and I love how few ingredients there are. Pinning to make soon! Thank you Marie, I hope you enjoy it. It’s a favorite at our home. What would a serving size be considered? This was amazing! I made it tonight and my husband loved it! Yay! I’m glad you guys enjoyed it! We all love it too! The general rule as far as THM concerned is to not exceed 1/5 of the cooked pasta/serving for Dreamfields. So I’d stick to that as a guideline. With that in mind, I’d guesstimate the serving size to be 1 to 1 1/2 cups of pasta and 3/4 cup of chicken breast. Hope this helps! Any idea on the calorie amount? I’m sorry, but I’m not sure what the calorie count is for this dish. Had this for dinner. Oh my gosh, it was awesome! The hubby and kids devoured it. This will definitely go into out weekly THM rotation. This is the second THM meal I’ve made since being on plan and wow, is it good! I used an entire box of pasta, and IMO the pasta is a little too much so there’s not quite enough “sauce”, but we will definitely have this again, just with 1/2-3/4 of a box of pasta. Thank you so much!! You are welcome! Glad you enjoyed it! Thank you Stacy! Your additions sound yummy! Wow!! Wow!! Wow!! This was AMAZING!! My husband and picky 7-year-old daughter loved it. After just a few bites, my daughter asked if she could have seconds! She also asked me to get the ingredients to make it again tomorrow! My husband said, “This is healthy? ?” I said with the THM plan it is lol. (I double checked this site again too bc I couldn’t believe it either lol). I’m still a newbie with THM so I haven’t really made any on-plan meals. This is definitely a keeper!! My kiddos really love this meal too!! So glad you guys enjoyed it! I made this tonight it was amazing. I am only on week one of THM and not sure how this is an S meal but I am definitely going to make it again. It was so delicious. I added a few mushroom and will probably add in some veggies next time. Holy cow this was good. The husband (a very anti-diet guy) told me this food was “kick a**.” As a newbie to THM, how was this an S? The carb count in the dreamfields pasta is like 40-something per serving. Am I missing something? So the jury is still out but THM’s stance on the carbs is that the particular ones in Dreamfields are not processed the same way. There is debate about it but if you google it, you’ll be able to read more up on it. Can’t wait to try this!!! !…but have a question….if I kept this recipe more traditional (keeping the egg sauce), how does that influence the type of meal? -I am still learning difference between S and E and FP.